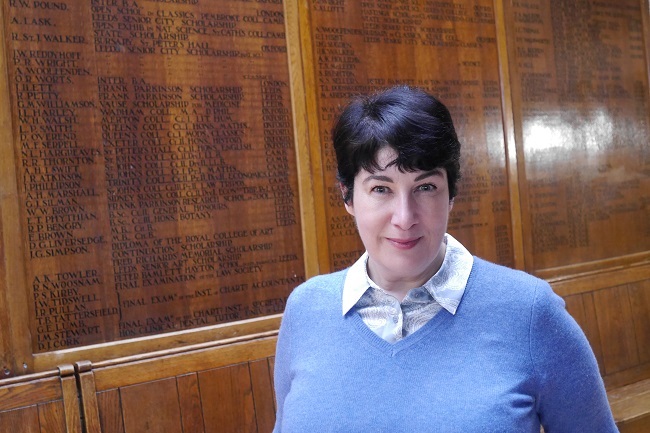 Author and former teacher Joanne Harris took a trip down memory lane this week when she was the guest of honour at Speech Day for The Grammar School at Leeds (GSAL). During her 12 years as a French teacher at Leeds Grammar School (LGS), Joanne had attended many such ceremonies, held annually at Leeds Town Hall to celebrate pupil achievement and present prizes and examination certificates. Joanne addressed the audience of pupils, parents, staff and governors, drawing on her own experience as a teacher to impart some key messages to the assembled students, all of whom are all within the last three years of their school careers. Joanne said: “Just as important as the exam certificates you’re receiving are the things that are not tested. A worthwhile learning environment is about more than just the lessons; it’s training for life and the world. Prior to the evening’s prize-giving in Leeds Town Hall, Joanne had spent the day at GSAL’s Alwoodley Gates campus, meeting current staff and pupils and some former colleagues. She had spent just a year as a teacher at Alwoodley Gates following the relocation of LGS from Woodhouse Moor in 1997, before leaving to focus on her writing career. During her visit Joanne reflected on how school life has changed, most notably with the school merging to become co-educational.